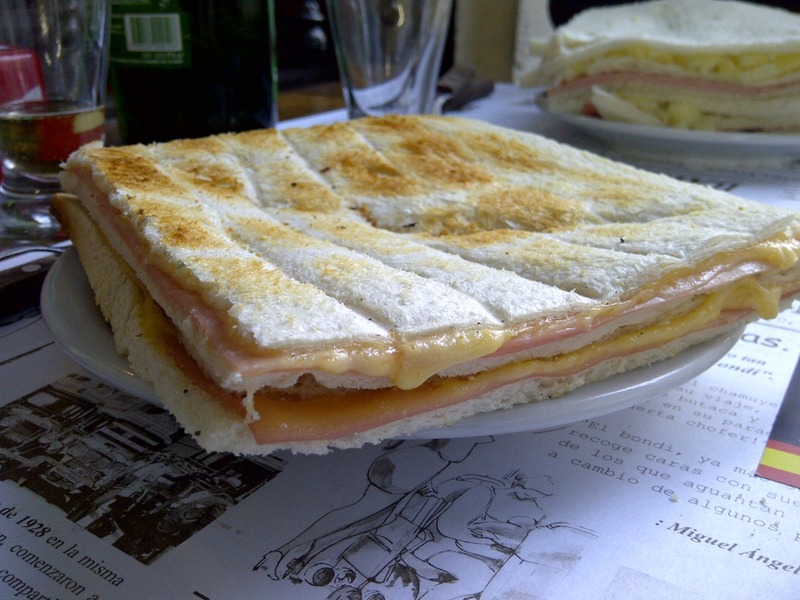 Sandwiches de miga are the perfect cheap lunch-time snack ubiquitous in Buenos Aires. Incredibly light and airy crustless, double-layered, 5-bite, white-bread sandwiches often made with ham and one other ingredient. Both of these cost me about $1 dollar and gave me the perfect mid-day boost of energy I needed after class without weighing me down. People I´ve met who have lived in this city for a while are sick of them. Perhaps I will be too eventually. But for now, I cherish them. 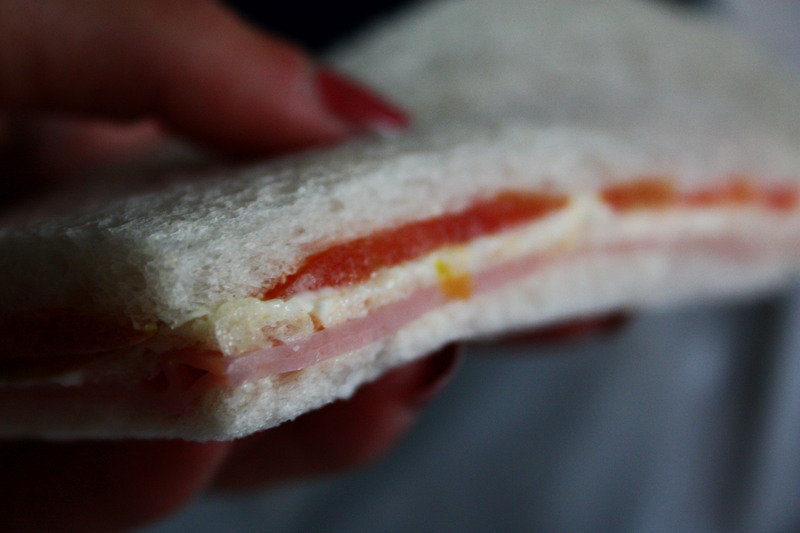 Ham and Tomato Sandwich de Miga from Confiteria la Victoria in Recoleta. A thin layer of ham, a thin layer of tomato and a bit of mayo. Very simple yet satisfying and refreshing in a way. The bread was super soft and posed no challege when biting into it, making the sandwich incredibly easy to chew and swallow. 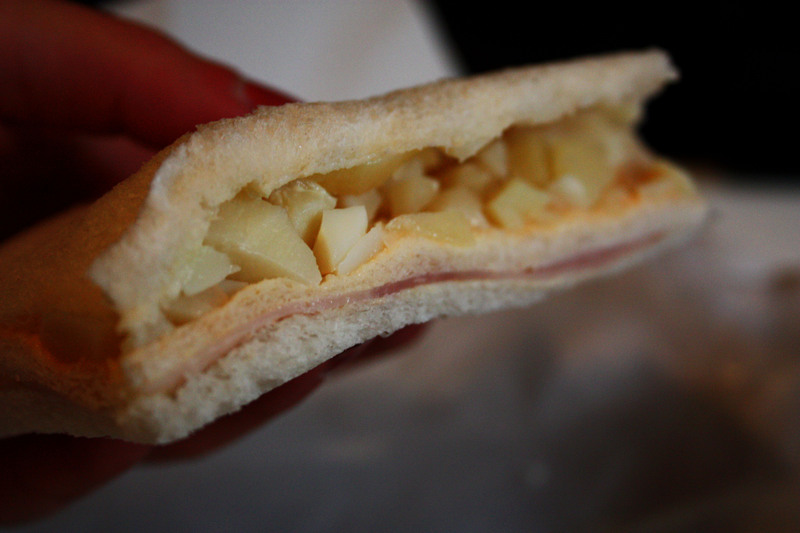 Ham and palmita (heart of palm) Sandwich de Miga from a Confiteria (name unknown) at the corner of Sarmiento y Lambare´ in Almargo. Three layers of that same pillowy-soft white bread incasing a thin layer of salty, slightly chewy ham, a bit of yellow cheese melting into a thin layer of butter and soft-yet-with-a-bite chunks of heart of palm. A fantastic little snack. 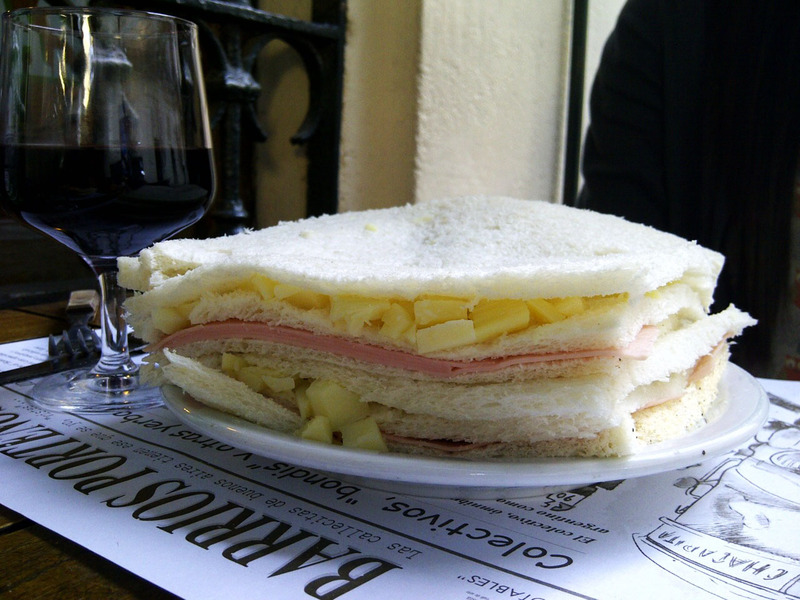 Tostada Mixta (ham and cheese) toasted sandwich de miga from La Poesia, the beautiful and historic San Telmo cafe/bar my friend and I just happened to sit down for a snack at while wandering about the barrio. It was the perfect afternoon snack to wash down with a beer after class. The salty, chewy ham blended nicely with the melted cheese and the thin slices of white bread were even airier toasted than not, which made the sandwich crunchy and satisfying yet very light. Jamon Crudo y Palmitas (Another ham and heart of palm) from La Poesia in San Telmo. I had told my friend about this sandwich and she decided to get her own, … and boy did she! This gigantic triple-layered sandwich was packed with hearty chunks of heart of palm and much thicker slices of ham. Didn’t have any of it, but it looked fantastic.